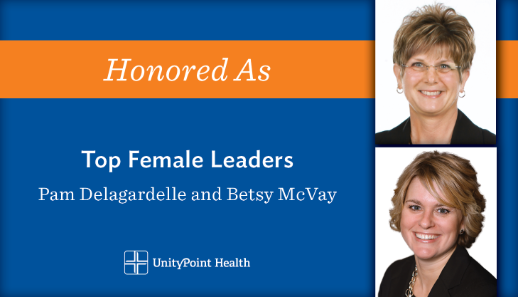 Becker’s Hospital Review named two UnityPoint Health leaders to its prestigious list of Women Hospital and Health System Leaders to Know. Betsy McVay, Vice President and Chief Analytics Officer, and Pam Delagardelle, UnityPoint Health—Waterloo Chief Executive Officer, are among the 130 women from across the nation identified on the list. “I’m so proud of Betsy and Pam. Their leadership makes UnityPoint Health what it is today and, with their guidance, we’ll continue to be even stronger in the future,” Kevin Vermeer, UnityPoint Health President and CEO, says. Becker’s honored women come from a variety of institutions of all different sizes. Some represent leadership among multi-state organizations, like McVay. She guides analytics for UnityPoint Health as a whole, covering Iowa, Illinois and Wisconsin. “Betsy knows the importance of successfully partnering analytics, physicians, process engineers and operational leaders. To Betsy, it’s not just about collecting data, but rather, creating collaborative opportunities with clinicians and business leaders to identify problems and figure out the most appropriate tools for change,” Vermeer says. Other female leaders on the list are from smaller, critical access hospitals. Delagardelle is honored due to her strong leadership in the Waterloo, Iowa region. She oversees local work with the hospitals, clinic and home care entities in her market. “This year, especially, the Waterloo region tackled a number of big projects, and Pam has led her team through it without wavering from the health system’s mission, vision and values. Pam truly embraces every access point and always encourages teams to work together to help people go from getting well to living well,” Vermeer says. The women identified were selected based on Becker’s Hospital Review editorial judgement after evaluation of each nominee’s management and leadership skills, as well as career accomplishments.